Over the years we have met so many wonderful people through our music. Below we have posted some of the photos we have for all those great memories. 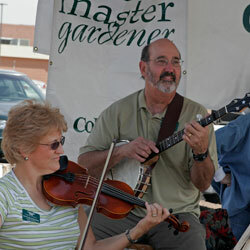 If your buying fresh fruits and vegetables in Pueblo, your likely to run into Kate and Pat doing what they enjoy. 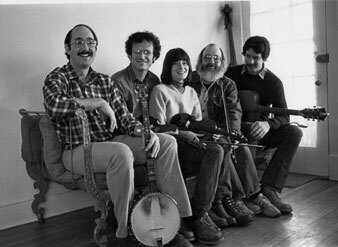 The Ethical Ramblers performing a benefit house concert supporting an education and healthcare delegation traveling to El Salvador. Kate is playing the fiddle with Johnny Buzek on guitar and Pat on banjo. 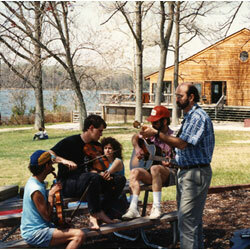 A Jam session at the Chesapeake Dance Weekend in the 1990's. 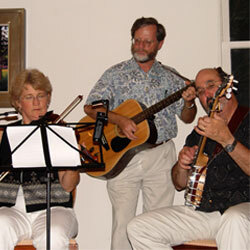 Dirk Powell and Claudio Buchwald on fiddle, John Schwalb on guitar and Pat's playing banjo. Pat was one of the original organizer's of the Chesapeake Dance Weekend which is now in its 28th year! Below is a link to this years program. 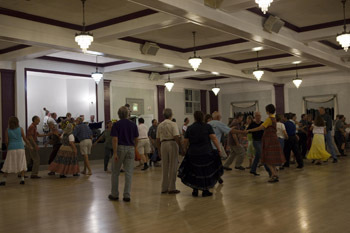 Hambone Sweets is a Stringband from Takoma Park, Maryland that formed to play for dances and cloggers in the Washington DC Area. Pat was a founding member and played with them for about 10 years. 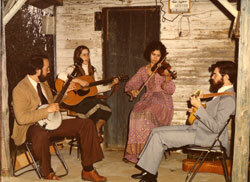 Here's a great memory of Pat's first band. Jacquie Wohl is playing fiddle. Jacquie was another founding member of Hambone Sweets. You will see her now as part of the Tuscon based Privy Tippers band.